Product benefits, not features, lie at the heart of every good marketing plan. Finding out what the benefits are that your customers are really looking for lays the necessary groundwork for designing a successful marketing strategy. To be clear, benefits are the specific advantages a product has to offer. If you are selling cars, benefits would include customer safety for him and his passengers, plenty of power for passing on the open road, good gas mileage to save him money. Simply put, benefits show the customer what is in it for him. Copywriting stacked with benefits keeps the reader engaged. This in turn keeps him reading and creates a psychological bond between his desires and your product. Aha! Therein lies the connection between emotions and products that drives sales. The result for you is increased business. Understanding the differences between benefits and features may seem trivial or even obvious. Even so, most marketing misses the point. It pays to transform your thinking so you don’t fall into the trap of confusing the two. As stated above, benefits are the advantages a customer can expect from your product. On the other hand, features are simply the raw facts about your product. Let’s do a little practice to see what this looks like for something as ordinary as a #2 pencil. Practicing this kind of thinking helps you wrap your brain around the contrast between features and benefits. 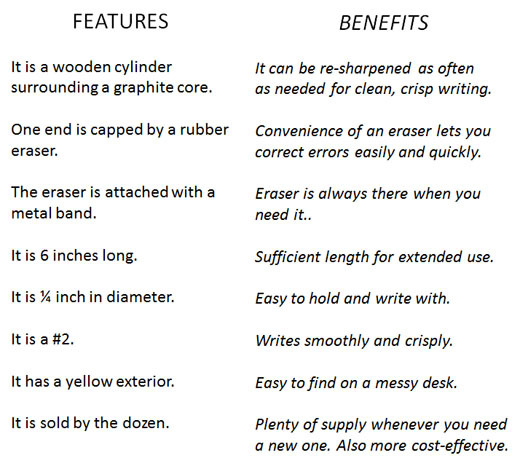 Even though you are most likely not selling #2 pencils, this little practice peek into such a simple product should help you with your own. If you have never done so, just take out a #2 pencil (!) and write out two columns about your product just like the ones above: column A with your product’s features, and column B with its benefits. Spend some time on this list so you can wring out every last benefit possible to your customer. Ask others to contribute to the list – employees, friends, anyone will take the time to help out. Start with a list of features, since that will enable you to uncover benefits more easily. Then determine how every single one provides an advantage (i.e., benefit) to the customer. You may even discover that some features can provide multiple benefits. Note that the list of features that you come up with should come across as bland and emotionally non-stimulating. In contrast, every benefit should help the customer save time, reduce frustration, and make life more enjoyable and productive. In other words, they have emotional appeal. If you are not sure about which emotions your product benefits might be addressing, take a quick look at my earlier article here: Emotional Appeal – The Key to Effective Copywriting. Just for fun (actually, for better business), once you complete your list of features and benefits, add a third column: emotions. Depending on your product, you may discover that your best potential customers should respond to a small set of emotions. For example, financial products appeal to fear of loss. Health products appeal to fear and vanity. If you are in the fitness industry, you might already be aware that the dominant emotion for marketing exercise programs and equipment is vanity. Marketing in all industries can benefit from appealing to curiosity, perhaps the number one emotion in the history of marketing. Barnham and Bailey led the way in appealing to curiosity. Just thing about how successful they were! Fortunately, the work and thought you put into uncovering the benefits of your product for your target audience can be applied repeatedly. 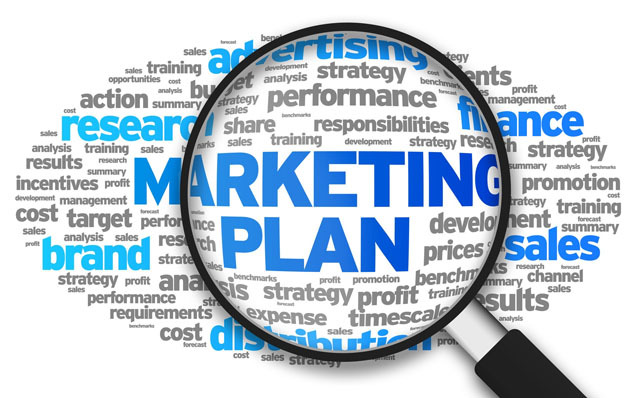 Use the thought exercises that I suggested above to create a marketing plan template. Then split test it, overhaul or tweak it for improvement. Then sit back and watch your business go BOOM! Go ahead, CONTACT US RIGHT NOW to see how we can help you power up your marketing materials with actionable, results-driven copy.